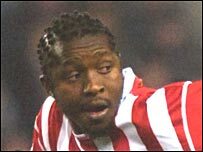 Stoke will take action against striker Sambegou Bangoura after he failed to return from international duty with Guinea for Saturday's game at Cardiff. Bangoura was expected in England in time for last week's game with Preston after the African Cup of Nations but is not now due to arrive until Saturday. "We'll discipline him, as he's let everyone down," Potters chief executive Tony Scholes told BBC Radio Stoke. Earlier this week, Stoke rejected a £2.5m bid from a Russian side for him.